Halloween is right around the corner. 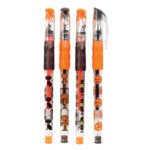 If you haven’t stocked up on bags of candy to hand out to trick-or-treaters yet… that might not be such a bad thing! Candy contains a lot of added sugar. In fact, sugar tends to be the first ingredient listed on the label, which means it is the ingredient used in the greatest amount. The amount of sugar in candy varies. 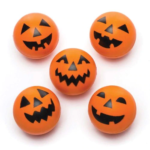 Click here to see the sugar content of some common Halloween candies. The American Heart Association recommends that kids ages 2-18 have LESS than 25 grams of added sugar each day – that’s over 6 teaspoons of sugar! That’s the same as about 1-3 pieces of candy, depending on the type and size. 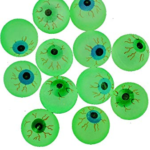 There are many other fun and affordable ways to celebrate Halloween without pouring on the sugar. Keep scrolling to read about 10 fun and easy non-food ideas. *PRO TIP* Look out for these items at your local dollar store, convenience store, or even try ordering online to save a few bucks (and little teeth!). Some of these items can be cheaper than a bag of candy. 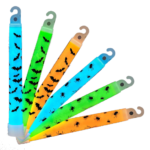 Glow sticks & necklaces – perfect for trick-or-treaters trying to find their way through the dark. Pencils, pens, crayons, markers, or erasers – they’ll be excited to show off their new erasers at school. 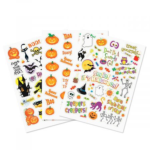 Stickers – who doesn’t love a good sticker? 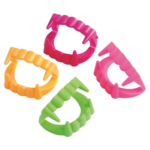 Spider rings & vampire fangs – they kids will show off these stylish accessories for days. 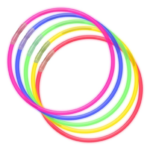 Bouncy balls – because they’re fun, too. 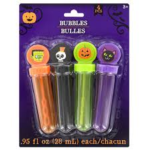 Whistles & kazoos – maybe they’ll create a new Halloween song. 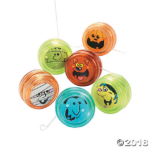 Yo-yos – an oldie, but goodie. 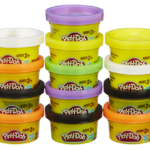 Play dough – in Halloween colors! 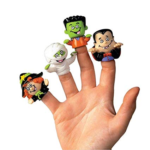 Finger puppets – always nice to have a friend on hand. 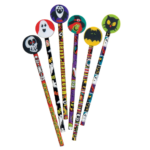 One more idea: Before giving out these treats, ask the trick-or-treaters a simple Halloween trivia question. When they get the answer right, let them pick their prize. 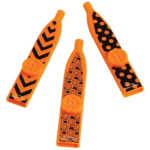 This is sure to add to the fun, and reward kids for thinking and working their brains! 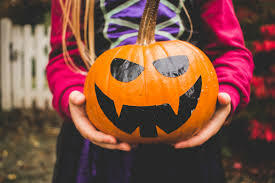 What is a pumpkin called after it’s carved? 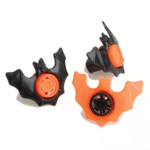 What are considered to be the two Halloween colors? What kind of creature is Dracula? 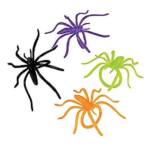 What creepy Halloween creature has 8 legs? What kind of moon makes werewolves come out?